Amid several frustrated attempts to get Congress repeal the Affordable Care Act, the Trump administration is taking multiple steps to simply inhibit the law's annual implementation. President Donald Trump even made a flatly false statement about the ACA in a Cabinet meeting, declaring that "Obamacare is finished. It's dead. It's gone". Whatever one calls it, the ACA remains on the books and is still the law of the land. Indeed, the online health insurance exchange HealthCare.gov, a utility created under the ACA, is hosting open enrollment for 2018 healthcare plans from Nov. 1 through Dec. 15, 2017 to enable people to secure policies through the marketplaces created by that law. The Trump administration has also rolled back the ACA's requirement that insurers provide contraception to women. And on Oct. 12, the White House announced that it would stop paying ACA subsidies to insurance companies that help low-income consumers pay for healthcare premiums. On Oct. 17, two U.S. Senators and Trump announced that they were working toward a deal that could continue these subsidies over the short term. It's not clear if the administration can actually stop those payments, though, and governors of 18 states are suing to force the payments to resume. Meanwhile, Trump has bragged that the move is hurting health insurance stocks. One important effect of cutting off the ACA's cost-sharing payments is how that strikes at the complex and interlocking set of conditions upon which the law is built. Without these subsidies, more low-income people are likely to go without insurance. And without as many people as possible in the overall insurance marketplace, it becomes harder to control the costs of both insurance and care. One big way in which a lack of insurance coverage for many people puts pressure on the healthcare system as a whole is the issue of "uncompensated care." This describes when people who are uninsured or poorly insured rely on emergency rooms and hospitals for medical care, and can't pay their ensuing bills. In healthcare industry parlance, uncompensated care encompasses both the cost of care that hospitals provide without expecting payment and bad debt resulting from unpaid hospital bills. Two Wisconsin healthcare industry observers explained in Oct. 13, 2017 interviews with Wisconsin Public Television's Here & Now that they're worried about uncompensated care costs rising again. "Uncompensated care is heavily correlated to the number of uninsured," said Brian Potter, chief operating officer of the Wisconsin Hospital Association, a trade association for hospitals and other businesses affiliated with the healthcare industry. In addition to advocating and lobbying on behalf of its members, the WHA is Wisconsin's official gatherer of data on uncompensated care. Wisconsin hospitals provided $994.2 million in uncompensated care in fiscal year 2016, according to a WHA report on the subject. That figure marks an increase from $918,007,556 in 2015, but is lower than 2014's amount of $1,307,107,606. Uncompensated care had been steadily increasing for at least a decade before the Affordable Care Act took effect. 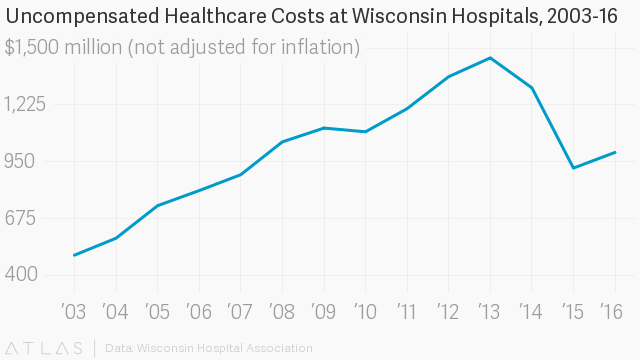 Potter attributes Wisconsin's decrease in uncompensated care costs largely to the ACA. That drop favors hospitals because it means more revenue, but that doesn't mean the ACA is simply a giveaway creating a windfall for them. "I think another important piece to understand is [that] when the ACA was started, one of the major funding mechanisms, because obviously there was an increased cost, was pretty significant Medicare cuts to fund that," Potter said. "While we've seen uncompensated care come down, we've seen Medicare losses go up. So purely from a financial perspective of a provider, it's been maybe slightly positive, but kind of a wash."
Another executive order Trump signed in October will allow insurance companies to sell cheaper, unregulated policies across state lines. Bobby Peterson of the public-interest law firm ABC for Health said this and other changes to the ACA are "all things that destabilize the marketplace." Those policies available across state lines might have lower premiums, but will also likely have higher deductibles and cover fewer services, which could result in more uncompensated care. Additionally, if people overall are paying less into the health-insurance system in the form of premiums, that might actually drive up costs for customers buying more comprehensive policies. "You're going to destabilize the risk pools out there," Peterson said. "You're creating small risk puddles of small groups that don't follow the ACA standards. People are going to get sick. They're going to drive up healthcare costs because they're going to get uncompensated care at the hospitals."